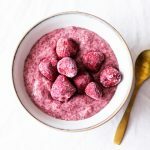 It’s been quite some time since I posted a chia pudding recipe, so I’m happy to revive the chia love with a perfectly seasonal twist on this raw breakfast favorite. I always associate the smell and flavor of citrus with Christmas; I have fond memories of sitting in Chloe’s bedroom when we were eleven and twelve, stringing up holiday lights, looking through magazines, and eating our way through cartons of clementine oranges. Citrus is slightly underutilized in my kitchen, but I always appreciate its brightness when I include it in my recipes. As we head into the winter months, that brightness becomes particularly welcome. 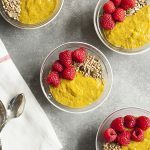 This recipe follows the same proportions as my basic vanilla chia pudding, but fresh ginger and orange give it a distinctive and festive flavor. As with all of my chia recipes, you should feel free to tweak the seasonings and sweetness to fit your tastes. Blend together the almond milk, ginger, orange zest and juice, and maple syrup. Pour the mixture over the chia seeds in a medium sized mixing bowl. Stir the mixture well, and then give it another stir every five minutes for the next twenty minutes. Place the mixture in the fridge for at least two hours, or preferably overnight. 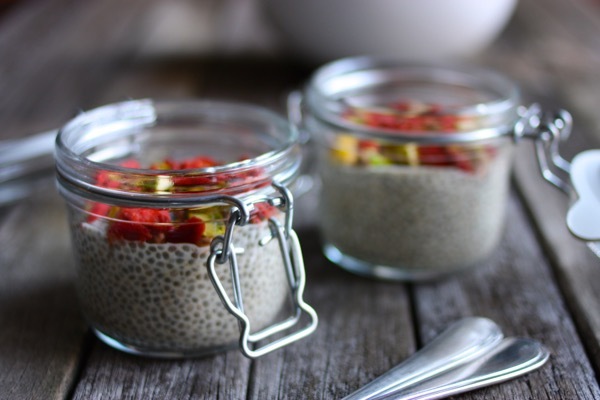 To serve, divide the chia pudding into four mason jars, cups, or serving bowls. 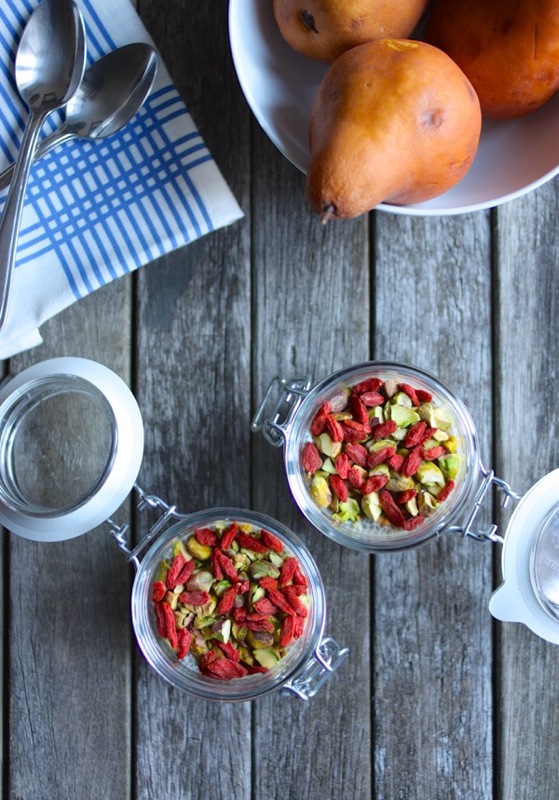 Top each with two tablespoons of pistachios and one tablespoon of goji berries. Note that, for a full breakfast bowl, I typically consider the 3 tablespoon chia : 1 cup almond milk ratio to be a single serving. So, these little cups are about half a serving each — topped with the nuts and berries, of course. I think of them as a snack/dessert, but feel free to use the recipe to make 2 servings instead of 4 if you’d like something a little more fulsome. I should add that these chia cups make presents gifts for any friend who happens to live close by; deliver them in cute mason jars and fasten them with a festive ribbon for the gift of an instant breakfast! 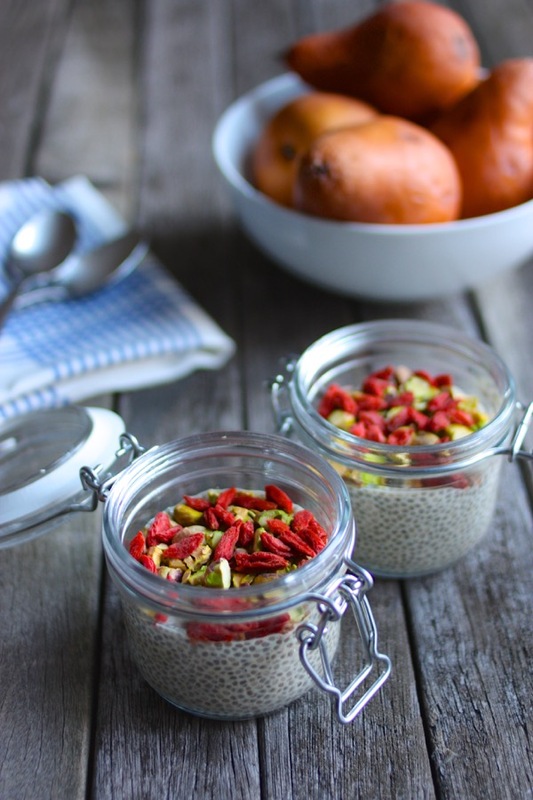 Hope you enjoy adding this chia recipe to your collection. Till soon, friends! That looks beautiful! 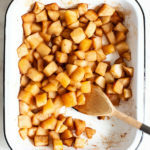 I love the versatility of this recipe, too – it would be so easy to change up the fruits and nuts with each season and create entirely new flavors. I’ll have to try these out! Thanks Gena for sharing and congrats on your cookbook! This looks great! 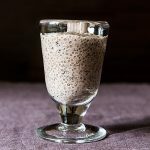 I’ve noticed a few chia puddings emerging in blogs lately. I like your spin with the citrus. I’ve never made a chia pudding; I guess its time to try! Thanks Suzanne, hope you enjoy it! Gena, these are so gorgeous! 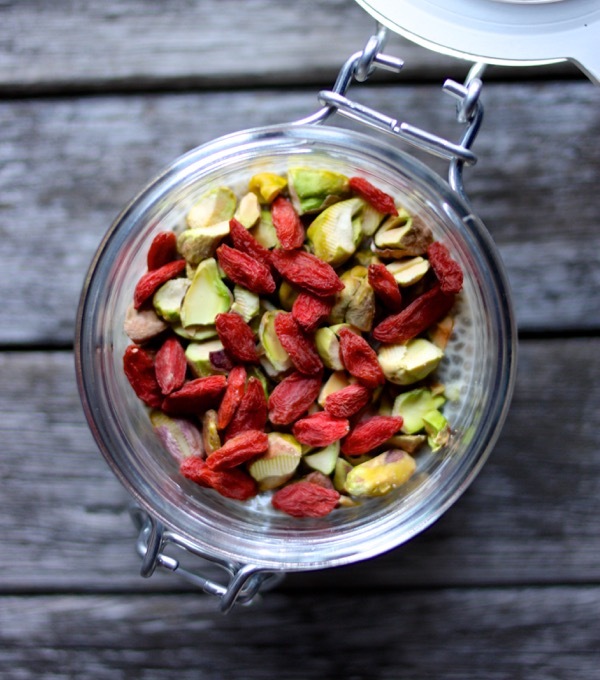 I love the green of the pistachios and the red of the goji berries. So festive! Oh my! 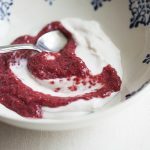 Made these today – super yummy, and a nice change from the usual chia puddings! This might be my new ready-made breakfast! I made a second batch using a chunk of creamed coconut mixed with water (instead of almond milk), that was awesome too.